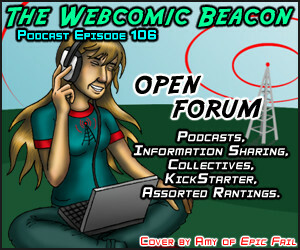 Zoë (All Over The House) joins Fes, Tanya, and Mark to discuss some current events in webcomics. Such as other webcomic podcasts, collectives, KeenSpot, Webcomics.com moving to a paysite model, Kickstarter, and then just kinda falls apart as usual. Hooray! Cover Art by: Amy Letts (Epic Fail). Thanks to Witchiebunny, our announcer! Show notes: Webcomic Builder (zoe-at-zoerobinson-dot-com), Webcomic Planet, TGT Webcomics, The Gigcast, Digital Strips, Webcomics.com, Tall Tale Radio, Webcomic Hell, Webcomics Community, Exiern, Point Guardian, Comic Tools, Kickstarter, Tigerbuttah (Tiny Kitten Teeth) Kickstarter, Sorcery 101 Kickstarter, Poorcraft Kickstarter, Diana Nock, KeenSpot, Rampage Network, Xepher.net, Gypsygirl, Quantcast, Google Analytics. 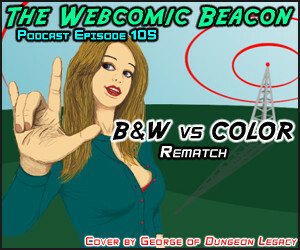 Darcy (Codename: Hunter), Mike (Prepare to Die), David (Zampano), Lem (Blank It), and Ben (Hero Academy) joins Fes and Mark to discuss B&W vs Color webcomics. This is a final revisit to the debate of which is better: black and white, or color. You’ll find out there is no real winner, but oh we love to fight about it! Becky (Sailor Ranko), Thom (910 CMX), and Ben (Hero Academy) join Fes for a late-night discussion. 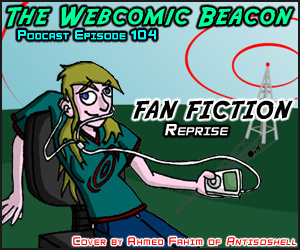 We clear the air with some drama stirred up in episode 102, and then move on to discuss a bit more about fan fiction. We also talk about the creation of the 910 CMX Community. Tangents Reviews, The Wotch, Cheer!, El Goonish Shive, Exiern, Sailor Sun, Other 910 comic forums, Dominic Durgan, Red Letter Media (Star Wars and Star Trek reviews), Eragon: The Greatest Movie Ever, There Will Be Brawl, Breakfast of the Gods, City of Reality, Penguicon, Nicholas Ivan Ladendorf’s polictical comic pages, Exiern Help. R. C. Monroe (Out There) joins Fes, Tanya, and Mark to talk about… stuff! 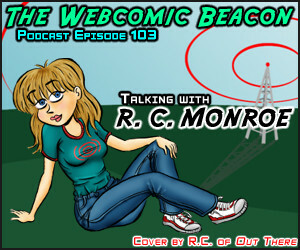 We start with discussing R. C.’s ridiculously long buffer, cartooning style, and professionalism. From there we move on from there into a enjoyable assorted conversation!